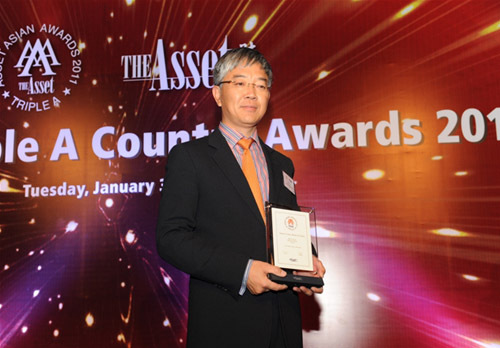 Recently, Agricultural Bank of China Limited (ABC) was awarded the "Rising Star Domestic Bank, China" in the Triple A Country Awards 2011 held by The Asset magazine. Mr. Liu Xiaochun, President of ABC Hong Kong Branch, attended the awarding ceremony and received the award on behalf of ABC. The Asset is one of the most influential financial magazines in Asia, with target readership of employees of international investment banks, commercial banks and capital markets. The annual triple A country awards activities enjoy a high popularity and recognition in the global financial market. The award reflects the acknowledgement of the media, the public and the investors on ABC's steady and rapid performance growth since its listing, as well as on its promising prospects and great growth potential.